Enlarge / The crew of the USS Orville stands ready for a new season of adventures in season 2 of The Orville. Series creator and star MacFarlane (The Family Guy, Cosmos), who plays Captain Ed Mercer, was a huge fan of Star Trek growing up, particularly The Next Generation (where Bormanis got his start), as well as The Twilight Zone and the original Cosmos series hosted by the late Carl Sagan. “He’s grounded in that kind of science and storytelling, and very much wants to preserve those standards,” said Bormanis. Sometimes the science is real, like a diagram of a DNA molecule or the spectrum for a red giant star that appears on the ship’s graphical display in an upcoming episode in season 2. Other times, it’s necessary to invent plausible-sounding science-fictional concepts and technologies, hopefully making them sufficiently plausible to the more scientifically literate viewers. “I see it as part of a long tradition of science fiction storytelling, pioneered by people like Jules Verne, H.G. Wells, and Robert A. Heinlein—writers who wanted to bring real science and engineering credibility to their stories,” said Bormanis. Where Chief Engineer Steve Newton (Larry Joe Campbell) keeps the Orville running smoothly. Another part of the engine room. Examination table where Doctor Claire Finn (Penny Johnson Jerald) plies her trade as Chief Medical Officer. Packing up the medical quarters as season 2 taping winds down. Hallways connect different parts of the set. A spiral staircase connects the upper and lower parts of the set. Control panel displays are a mix of real science and fiction. Lieutenant Gordon Malloy (Scott Grimes) sits here. Some spare parts laid aside for Isaac (played by Mark Jackson). A means of interstellar travel is the first scientific challenge any show like The Orville faces. Star Trek has its warp drive; MacFarlane opted for a “quantum drive” to power his fictional starship. Bormanis was initially stumped as to how such a thing might work, given that quantum mechanics governs the subatomic realm, and the Orville is an enormous craft moving faster than the speed of light. But he reasoned that physics would likely have advanced sufficiently by the 25th century to include a grand unified theory, at long last uniting all four fundamental forces (electromagnetism, strong and weak nuclear forces, and gravity). One thing you won’t see on The Orville is a transporter, Star Trek’s iconic means of teleportation. As for what the ship uses for a primary power source, MacFarlane initially wondered if thorium would work, a radioactive element used in certain newer nuclear reactor designs instead of uranium. But thorium couldn’t produce anywhere near the energy the Orville would require. So Bormanis came up with his own fictional heavy element, dysonium (named in honor of physicist Freeman Dyson), something with an atomic weight in the 130-135 range—well above the transuranic elements in the period table. USS Orville crew members Lt. John LaMarr, First Officer Kelly Grayson, Chief Medical Officer Claire Finn, Captain Ed Mercer, Lt. Cmmdr. Bortus, and Science & Engineering Officer Isaac. Lt. Alara Kitan (Halston Sage) arm wrestles with Isaac. 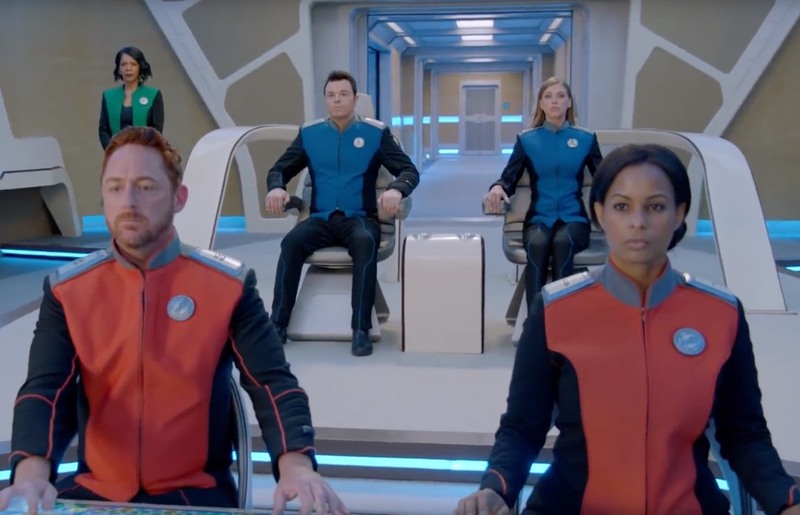 Lt. Gordon Malloy (Scott Grimes) at the helm of the Orville. Captain Ed Mercer (Seth McFarlane) attempting a toast. Looks like arch enemies the Krill will be back in season 2. Kelly and Bortus engage in a spot of banter. A pile of skulls probably isn’t a good omen. Exterior shot of the USS Orville. Onward to the next adventure. There’s plenty of biology as well as physics to be found on The Orville. In the pilot, Ed walks in on Kelly hooking up with a blue Retepsian alien named Darulio (Rob Lowe), effectively ending their marriage. Later in the season (“Cupid’s Dagger”), Darulio is back on the Orville in his archaeologist capacity—and he just happens to be in the middle of his species’ mating cycle. Bormanis even worked in a spot of evolutionary theory for that episode. Two warring alien species, the Navarians and Bruidians, have been at loggerheads for centuries over which race has the best claim to their shared planet. Darulio’s pheromones help ease tensions between the two ambassadors (temporarily). But his DNA analysis of ancient fossils reveals the races share a common ancestor. “One can certainly imagine a scenario in which a humanoid species goes out and colonizes planets throughout the galaxy, and after a hundred thousand years, you’d start to see some pretty significant differences,” said Bormanis. One of Bormanis’ favorite episodes in that regard is “Majority Rule,” when Kelly leads an undercover exploratory team to find two missing archaeologists on an Earth-like planet that bears a strong resemblance to our culture today. The twist is that everything is decided by public upvotes on their version of social media: laws, nutritional advice, scientific “facts,” and so forth. One crew member immediately runs afoul of a viral shaming campaign, for which the penalty of not getting enough upvotes is a lobotomy. Season 2 of The Orville debuts Sunday, December 30, on FOX. The Orville season 2 trailer.